When I first watched The Legend of Korra, I wasn’t too happy with it. I said “I generally enjoyed watching it, but was constantly aware of major flaws in the story” in my first review of the series, and though my second review, just before the second season came out, was more favourable I still didn’t rate it highly. Now I’ve got the DVDs for all four seasons, and it’s time I re-examined the series. Over the coming weeks I will be examining the show in more detail, looking at the successes and failings in its writing. The episode starts with a concise and effective introduction that bridges the gap between the original series and this new story, narrated by Tenzin – Aang’s son and a key character in The Legend of Korra. It’s a good way of showing continuity while acknowledging change. 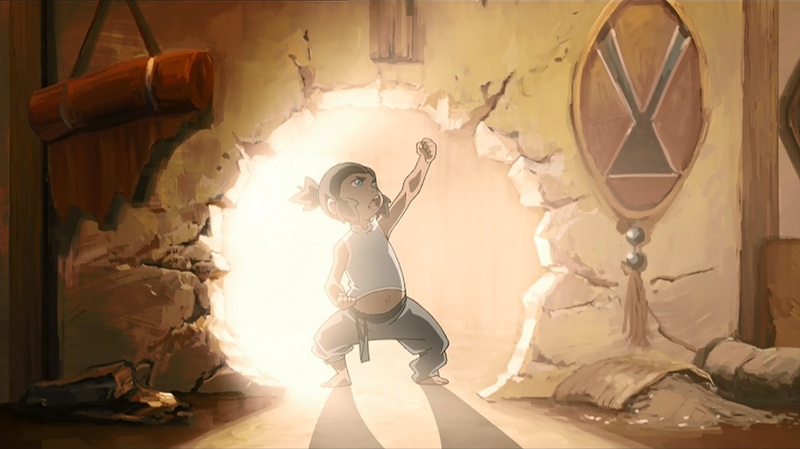 We start off with a fun little introduction to Korra and her parents, showing the titular Avatar as a chaos-causing toddler capable of water, earth and firebending. Korra’s personality comes through in few seconds of animation and a single line of dialogue. 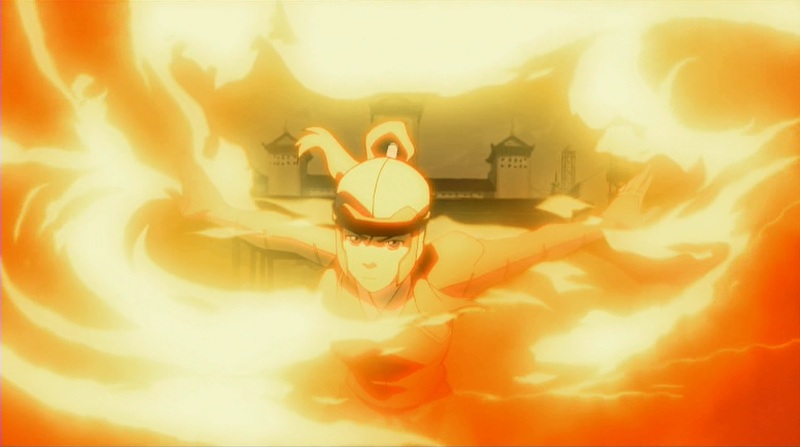 A well timed cut, within a fire blast, takes us to the modern day where a teenage Korra demonstrates her firebending abilities to the White Lotus and Katara. Shortly afterwards, Tenzin and his family arrive – with a brief nod to the outstanding question at the end of ATLA, what happened to Zuko’s mum, asked of Katara by her eldest granddaughter, Jinora (with the answer interrupted by her other granddaughter, Ikki). 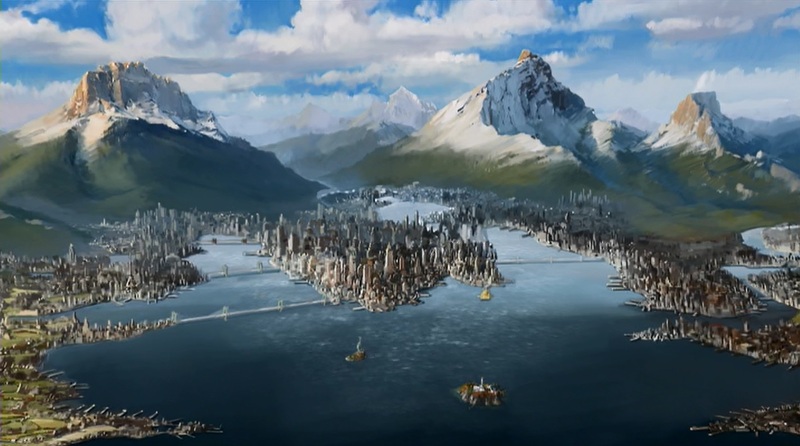 Here some of Korra’s background is established: all her training has been and is intended to be at this compound in the Southern Water Tribe, with teachers coming to her, but this time Tenzin, who aside from being the only living airbending master is also one of the leaders of Republic City, can’t stay. And Korra can’t go with him; she has to remain where she is safe, cut off from the world she is training to save. Of course, she goes anyway, travelling as a stowaway on a ship. 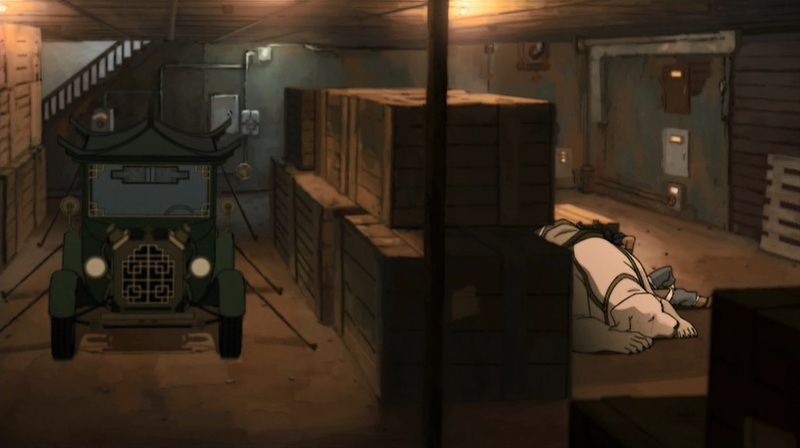 That ship, and the Satomobile being transported within it, form an effective brief visual introduction to the technological level of the world that is subsequently expanded upon when Korra arrives. I love the design of the Satomobile. It really looks like it came out of an Asian culture – which inspired many of the cultures of Avatar: The Last Airbender – while at the same time looking very much like early cars of Earth. It’s a fantastic visual worldbuilding element. This whole sequence is pretty well done. Sure, the creators could have saved time if Korra just went to Republic City with Tenzin to begin with, instead of being told to wait and instead stowing away on a ship, but this way is a far stronger scene. It shows the rigid and controlled life Korra lives under White Lotus supervision, and thereby her lack of knowledge about Republic City and her naiveté about city life. It demonstrates her rebellious side, the part of her that doesn’t listen to authority if it doesn’t suit her. And by having Tenzin need to return to Republic City to deal with problems there, it anticipates the problems Korra will face there. When Korra gets to Republic City there are three key things she finds: firstly, she encounters a homeless man in the park, and through him learns that not all of Republic City’s inhabitants are prosperous. There is wealth disparity here. Secondly, she comes across a political rally in which a speaker accuses benders of oppressing non-benders. Korra takes this personally and responds impulsively. Here’s another example of fine writing: not only do we get a second clue to the core conflict of the season, but we also see Korra’s confrontational nature, and her political inexperience. She responds without knowing the situation, perceiving the speaker’s claims as a personal attack on her, since she is the ultimate bender, the Avatar. A familiar reaction to anyone who frequents discussion forums online, whenever a political position, fan favourite show, sports team or anything else which has passionate followers is criticised. 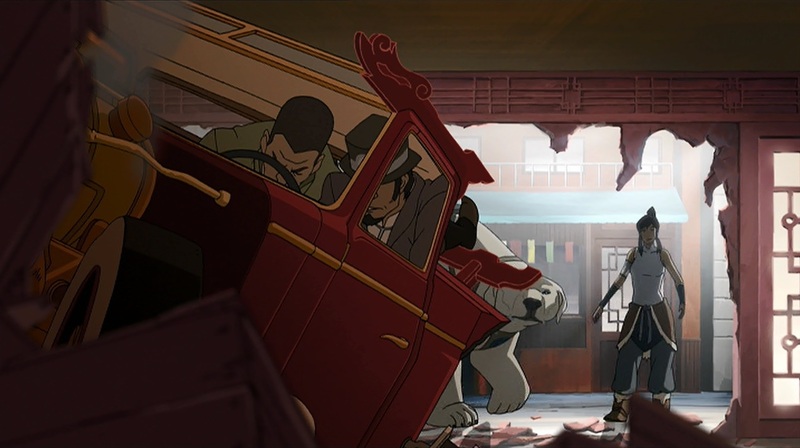 Finally Korra encounters the Triple Threat Triad engaged in a protection racket. Here is demonstration of exactly what the political speaker was saying: benders using their abilities to profit from non-benders. That’s not a lesson Korra seems to have learned yet, but she does see the opportunity to be the Avatar here, and beats up on the criminals, feeling superior at her victory – until, that is, the police turn up and arrest her for the damage she has done in the process to private and city property. After seeing numerous super hero flicks and other shows in which protagonists face no consequences for the damage they do in the process of defeating the bad guys, this was very satisfying. (Though Captain America: Civil War did finally catch onto this idea.) As Lin Beifong says, “You can’t just waltz in here and dole out vigilante justice like you own the place”. I wish Lin had been around in other shows too. After her arrest and release Korra persuades Tenzin that she’s needed in Republic City – the city is out of balance, she’s seen the problems it is facing and she needs to be here. She can help people and learn airbending in Republic City; she can do neither back home at the White Lotus compound in the Southern Water Tribe. As an introductory episode, this does very well. 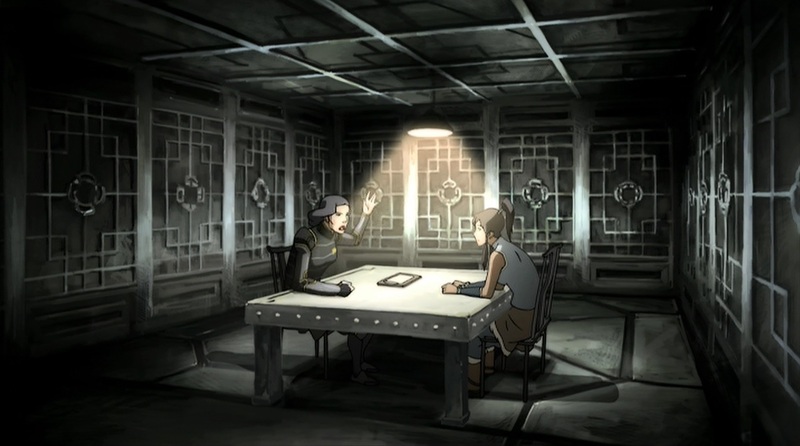 It reveals information about the characters and the world gradually: first, Korra and the White Lotus compound. Then the suggestion of advanced technology, followed by its implementation in the city. We see some of the problems Republic City faces one by one, followed by the legal and structural framework Korra will have to work within when Lin comes along. So far, the rest of the Krew don’t make an appearance at all. 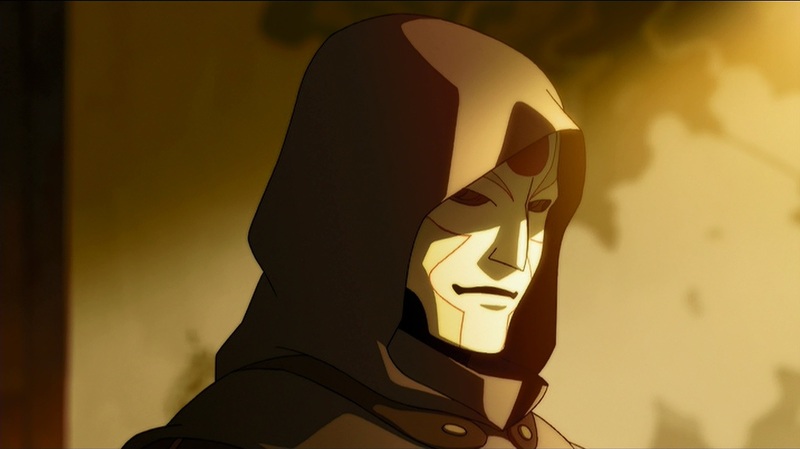 But some of the key characters are there: Korra, her mentor Tenzin, Chief of Police Lin Beifong, and finally Amon. Amon’s introduction is masterfully done. We see an image of him and hear the grievances of his movement in the park at the political rally. 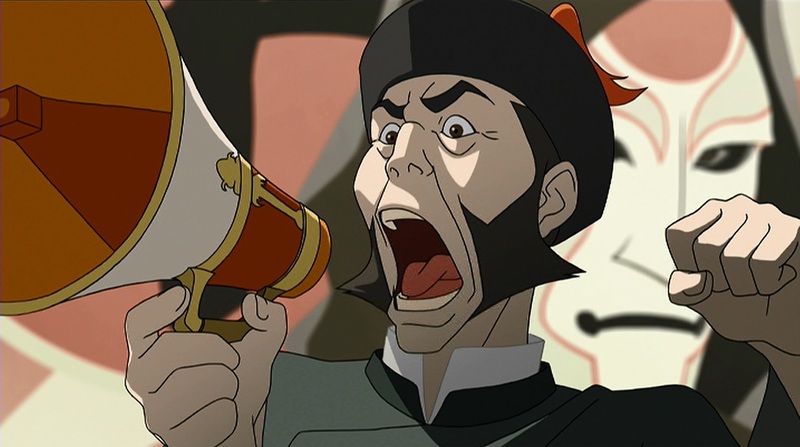 The movement is mentioned a second time during Korra’s press conference, when a journalist asks whether she will fight crime or the non-bending revolution – or both. Finally, we see Amon himself, listening to the press conference on the radio, and deciding to accelerate his plans – a sinister final shot to the episode.